It wasn’t a question of if, it was a question of when. Earlier this week, following a humiliation at arch-rival Barcelona, Real Madrid told coach Julen Lopetegui it wasn’t working out. Just 139 days into a three-year contract, arguably the biggest football club in the world, took away arguably the biggest job in club football. When it comes to managers, patience is not a virtue at this Spanish club. In the last 20 years, 15 managers have come and gone at Real Madrid. Remember Carlos Queiroz, or Mariano Garcia Remon, or Vanderlei Luxemburgo, or Juan Ramon Lopez? About a decade ago, they were doing a Lopetegui at Real. The maximum tenure a manager has had in these two decades at Real is three years: Jose Mourinho and Vicente del Bosque. And, even by the end of the third year, it felt like overtime. It’s not just Real Madrid. It’s the nature of the beast—managing football clubs at the highest level in Europe. This landscape is littered with corpses of football managers who were felled by that one demand: success. We looked at managerial tenures for 16 super clubs—which operate at a higher level in terms of fan interest and financial stakes—across five prominent European club leagues over the last 20 years. As many as 12 of these 16 clubs have had more than 10 managers in this period (chart 1), or an average stint of less than two years. English clubs, other than Chelsea, tended to show greater patience with their managers during this period. It’s not just Manchester United and Arsenal, where Alex Ferguson and Arsene Wenger, respectively, had remarkably long runs and were fixtures during this 20-year period. It’s also a club like Liverpool, where Gerard Houllier and Rafael Benitez had six-year stints, and which has changed managers mid-season—the ultimate sign of desperation—only once. In comparison, Real Madrid have changed managers mid-season five times during this period. Then again, the bar for expectations is different in different leagues. What is good for Liverpool is the-manager-must-go by the lofty standards of Real Madrid. 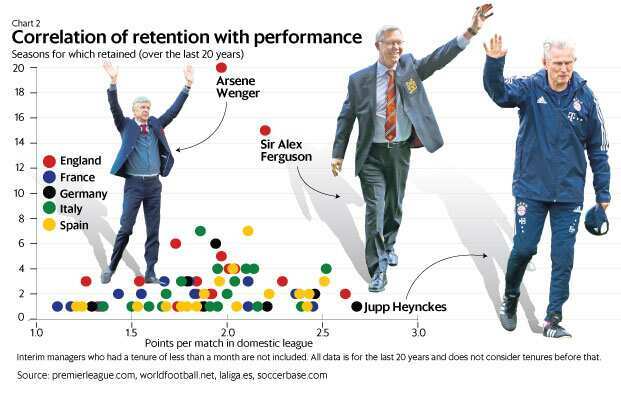 We correlated performance of managers—as measured by average points per match accumulated by the club under them in the main league—with their tenure. The bar for expectations does appear to be kinder in the English league and does not seem to be tied to performance in the Champions League—the premier competition pitting clubs from Europe against each other—as tightly as in other leading clubs elsewhere. As many as 15 of the 27 years that Alex Ferguson spent at Manchester United fell in this period, during which he averaged 2.2 points per match (out of 3). Similarly, Arsenal stuck with Arsene Wenger during this period, while he averaged 2 points per match and never really stamped their presence in the Champions League. 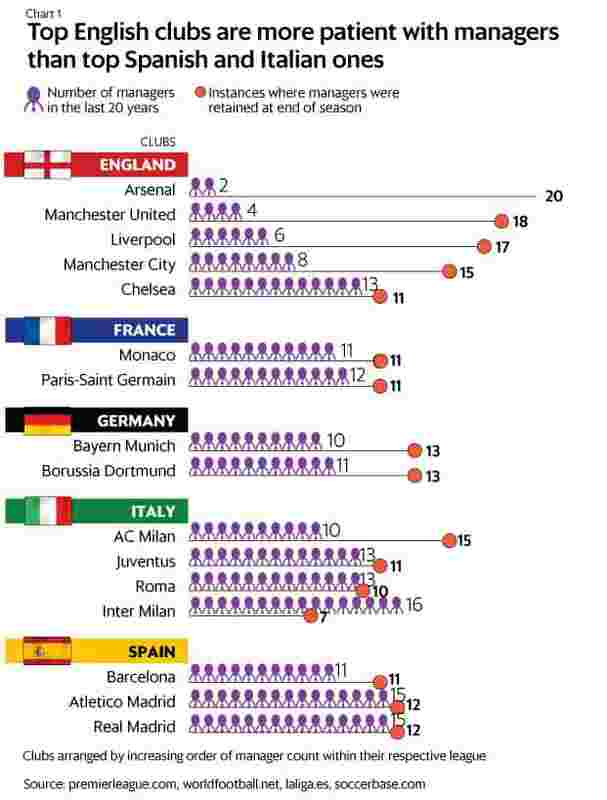 Elsewhere in Europe, there were managers who averaged more, but still parted ways with their clubs. Notably, Paris Saint-Germain (PSG), flowing with Qatari money and the expectations that came with it. Despite averaging 2.4 points per match, PSG separated with Laurent Blanc after three seasons and three league titles, and with Unai Emery after two seasons and one league title. In Germany, Jupp Heynckes averaged 2.7 points per match at Bayern Munich, more than any manager in a single club during this 20-year period. Yet, the club passed him over for Pep Guardiola—who became available after leading a golden tiki-taka era in Barcelona—with the expectations of a life in profile and success in Europe (chart 2). The kind of stints that Ferguson at Manchester United and Wenger at Arsenal had are becoming anachronisms in this echelon of club football, where a domestic league title is good but not quite enough, where a continuously evolving narrative that can be milked commercially matters as much as footballing success. Increasingly, the threshold of performance that triggers a managerial replacement is inching lower. For example, at the end of the 2004-05 season, the five clubs (from this set of 16) that replaced managers had an average drop of 3.6 positions in the league table that year compared their 20-year average. At the end of the 2017-18 season, as many as 10 of these 16 clubs changed managers—only the second time in these two decades, this double-digit number has been hit. But this time, these 10 clubs averaged a drop of just 0.9 position in 2017-18 over their 20-year average. Yet, they felt compelled to change, in what is another pointer to changing expectations (chart 3). Julen Lopetegui is the first big name to fall this season. Chances are, he won’t be the last. It’s just a question of when.